American inventors are passing up a sure-fire gold mine! New devices, popular abroad, would find a ready market in gadget-conscious U. S. A.
AMERICAN genius for invention and business built on astonishing new ideas is one of the most talked-about subjects in the world. There’s good reason. Last year an estimated $500,000,000 in royalties and profits went into the pockets of inventors. Does it mean that only Americans have a monopoly on ideas and inventions that pay off? If you think so, the chances are you’re overlooking a fortune. There are countless gadgets abroad which can inspire inventors here. A survey of the world scene since the end of World War II shows that literally thousands of new inventions and ideas have earned countless millions for on-the-ball people in practically every country in the world. Yet these new inventions and ideas are virtually unheard-of in America up until the present time. And he’ll continue his talk with you for as long as necessary, still without going near his telephone. In fact, he may even call in a few assistants who will join in on a three-way or four-way conversation, almost as if it were a conference which, indeed, it can be if necessity warrants it. He’s using an amazing new electronic gadget just being marketed in England. Someone saw a need for something that can free a man from becoming a slave to his telephone, that will leave him free to go on doing whatever he pleases anywhere in the room, and Fonadek was the answer. It amplifies all incoming and outgoing voices. It has no electrical connection and can be placed anywhere in the room. All you do is pick up your telephone and hang it on the Fonadek. Millions of Americans will be surprised to learn that such an invention is possible, and profitable! Ever have trouble parking your car? Even Europeans with their tiny automobiles, many about half the size of the average American car, have the same headaches. Yet it remained recently for Hubert Jezler of Zurich, Switzerland, to come up with one answer to the problem He’s got a front and rear jack-like device that can be attached to your car. It’s controlled from the dashboard. Up against a tight space? Press the button, the jacks go to work and shove the jutting end of your car over to the curb where it belongs. In case you’re thinking of the same idea forget it. Jezler has already beaten Americans to the punch. He just took out U. S. Patent No. 2,612,230 for his product. Potential money-making opportunities, however, are not confined to the field of pure invention. New and profitable ideas for a weird variety of services are going full blast in many European countries. up a telephone in New York and getting California in a matter of seconds. We can dial for weather, the correct time and a World Series game score. But can you dial for the latest quotation on stocks and bonds? You could if you lived in Vienna. And also in Vienna, by dialing specially listed numbers, you can get: instructions on whether it’s good form to eat ice cream cake with a fork; an “A” tone for tuning your musical instrument; a recipe for cooking just about anything your heart (or wife) desires. Want to leave a message for a friend who’s out so that he can pick it up at his leisure? Just look up the service in Vienna and dial. There’s no one to stop an American from starting his own unique “Info-Dial” service. Pause for a moment and ask yourself what kind of a telephone service would solve a big headache for Americans? How many people would be willing to pay you for providing them with assistance or information over the telephone? Your answer might be the first step on the road to a paying idea. would be thankful for similar protection? Holdups aren’t the only problems connected with the taxi industry. One of the really major problems is the use of oversized cabs that frequently carry no more than one passenger at a time. This means higher cost, higher rates and less taxis in service. It was quite a problem in Milan, Italy, until recently. The solution came with the invention of a Micro-Taxi, which is really a taxi for two. Compactly built, it houses a motor-scooter engine and has ample room for a driver and one passenger seated beside him. It has a high speed, low gas consumption, makes lower fares possibleâ€”and attractive business! Don’t think that the British have their minds only on tea and crumpets. After World War II, rationing still continues. Many important consumer products are still tough to get. This means that the average British mind has to work overtime to dream up things that will make his life easier. In spite of the fact that more than 350,000 Americans visited England last year, practically no one came back with one of the new British ideas that may well find a profitable future in America. There is, for instance, a British device that keeps typewriter keys from jamming. There’s the piano that night clubs and canteens have long dreamed ofâ€”a drunk-proof, careless-proof piano. The surface is cleverly designed with such angles that no one can set down a glass of beer or a lighted cigarette and expect it to remain on the piano. It’ll slide off. One British firm is now manufacturing harnesses for pigs. Farmers there agree that it is easier and more efficient than penning in the porkers. One British inventor is collecting royalties on a hammock that won’t tip over, another on window blinds designed to block off the sun during any part of the day and from any section of the room. It helps preserve goods, furnishings and keeps rooms cooler all day long in summer. In America, children are always big business. Manufacturers and inventors are busy turning out new products and services that children need and parents want. Yet the field is still wide open and Europeans are proving every day that we still have a lot to learn. Look at Egon Moeller-Nielsen, a Danish artist. He fled his native country for Sweden after Hitler moved in but didn’t leave his imagination behind. Watching his own daughter at play one day in a playground near his home in Stockholm, he noticed that it was pretty much like playgrounds all over the world. He didn’t like the way the playground limited his daughter’s chances for fun. Moeller-Nielsen pondered the problem and came up with a unique idea in play-sculpture. He designed a colorful and strange-looking sphere inside of which were many secret hollows but all big enough for a child to crawl through. Then he followed this up with an artistic-looking sliding pond and experts hailed it as an exciting way to provide children with fun while giving them a taste of good art. The city fathers commissioned Moeller-Nielsen to design more equipment for a city park. He was an artist, not a carpenter or mechanic. But that was in 1949. Today, Moeller-Nielsen’s products can be seen in almost all of Stockholm’s city playgrounds. His ideas are being demanded by other European cities and there’s some talk of inviting him to America to give our own playgrounds the once-over. Meanwhile, America’s own playgrounds are literally crying out for new ideas to make life more enjoyable for children and to please parents who, after all, control the purse strings at city hall. Another Dane hit on an idea which could be a natural for a country that covers as much ground as America. His name is Falck and he established a private business to specialize in rescue work and in saving property during times of emergency. Today, he has a corps of 830 men working for him. They perform an average of more than 1,000 errands a day. The system is simple. Falck calls it insurance and the average charge is $2.70 per year for a family. Now many small towns, too poor to own their own rescue services, are paying Falck substantial fees to take care of the problem for them. How does Falck’s service work? Let’s say you own a small retail store in town. Along comes a big wind, blows in your front window and shatters glass all over the street leaving your merchandise exposed. Call Falck’s. One of his men will take care of the wreckage and guard your property. Or you’ve got a pet cat that’s strayed into the chimney and won’t come out. Send for Falck. You’re taking a trip and you get sick on the train. You need someone to take you home. It’s Falck’s to the rescue. What would you give if you never had to use a windshield wiper on your car, even in the heaviest rain? Our neighbors to the North have solved the problem, thanks to an invention by Donald F. Stedman of Ottawa, Canada. He’s already provided the aviation industry with a product that repels water from the surface of a rain-drenched airplane windshield. Naturally, it went first to the aviation industry because it is vitally important to keep the pilot’s vision clear. Stedman’s product is applied to the windshield surface, doesn’t distort vision, is easy to use, stores well and is inexpensive. “Do you know,” he added, “that practically every new mechanical device adopted by American automobile manufacturers in the last twenty years has originated in Europe? The ideas are there if we’ll just take the trouble to become alert and look over the possibilities.” He also concluded that the lack of ideas flowing to America can spell economic trouble for American business. 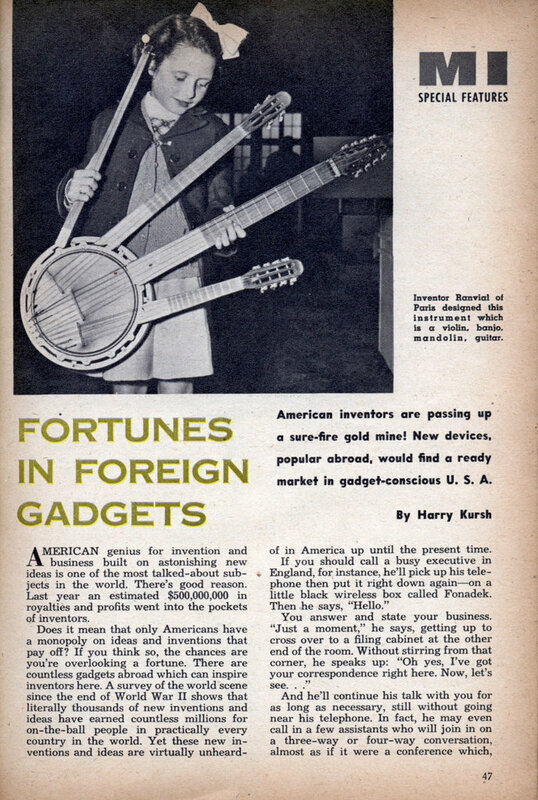 He urged American inventors to stick their necks out of their own backyards once in awhile and he warned American businessmen not to be too lazy to go searching for new ideas in Europe. How can you do it? Most foreign representatives interviewed in New York, where there are more consulates than any other city in the world, admit that they are always anxious to tell anyone what the people of their own nations are doing. But only rarely will someone write to them for information about new ideas and inventions in their countries. A little known fact is that practically every foreign embassy in Washington, D. C. publishes a weekly or monthy information bulletin. These bulletins, all printed in English, many with lots of fascinating pictures, are designed to acquaint Americans with events in countries overseas. Many contain, from time to time, news and feature items that are open tips to inventors and idea men. Most foreign embassies will place your name on their mailing list for information bulletinsâ€”free. Others charge very nominal subscription rates. In fact, our own State Department has a complete list of embassies in America, showing addresses and names of information offices. You can pick one up by asking the United States Government Printing Office, Washington, D. C, to send you a copy of the latest “Diplomatic List.” Thus you can select a roster of all the nations in which you are interested. To speed things along you also can ask the Chamber of Commerce of the United States, Washington 6, D.C, to send you their “Guide to Foreign Government Information Services.” This should prove extremely valuable in helping you to select names and addresses for subscribing to foreign information bulletins and, of course, there’s also your public library. 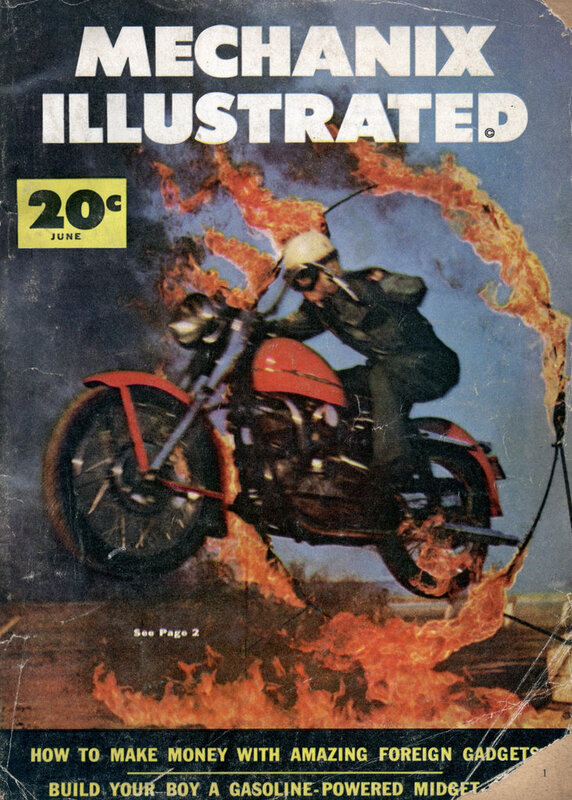 Many have foreign magazines published in English that can be a gold mine for ideas.